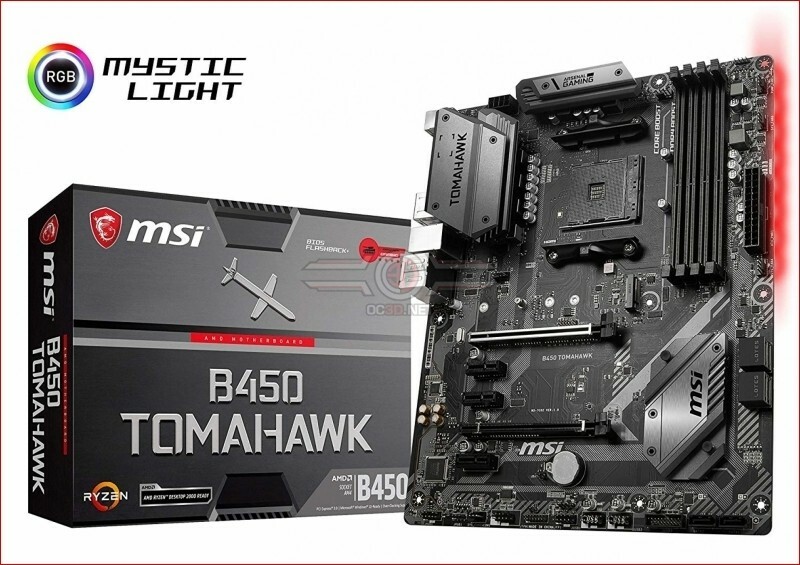 The B450 Tomahawk from MSI is an entry-level motherboard that comes with a few interesting features. At a first glance the B450 Tomahawk offers everything you need for your daily gaming system and it should come with a rather reasonable price. The B450 Tomahawk is based on an ATX form factor with four DIMM slots. Since the first model based on B350 chipset was featuring a red backlight around the ground layer isolation, we expect something similar on this motherboard too. There are two full-sized PCIe 3.0 x16 slots and three PCIe x1 slots. In general the layout is quite simple. In the storage department there are six SATA ports and only four of them have been angled. Apart from that you get one M.2 slot allowing the installation of differently sized SSDs. The M.2 slot is placed in the middle of the motherboard and it's compatible with 22110 units. In terms of pricing this particular board is placed somewhere between the entry-level and the mid-range market segment. In the case of the B450 chipset we generally believe that there are some interesting boards based on this chipset.